Tim Ho Wan (THW) officially opened in the heartland. After much fanfare opening of its first overseas outpost in Plaza Singapura, THW has made inroad to the heartland. The residents of Toa Payoh now can rejoice and licking their chops in anticipation to savour the popular Baked Char Siew Bao. After reading about their soft opening from RubishEatRubishGrow on my blogger buzz, Little Devil and I decided to try our luck on Friday (23/08) pre-empting that the queue won't be so long. So far, we have not tried the Plaza Singapura outlet yet, as we don't want to queue and we don't work near town area. Lucky for us, we can now claim that “We don't need to line up at Tim Ho Wan”. Understanding that it is currently on soft launch mode, we kept our expectations in check. The décor of the restaurant is very simple, light wooden colour and Zen like. The decoration is similar to the THW at IFC Mall in Hong Kong and Plaza Singapore(which I saw when I passed by). 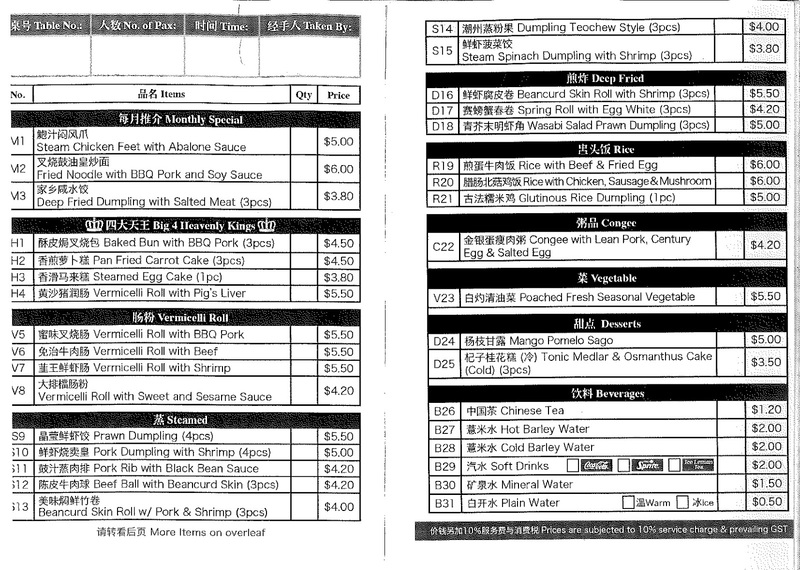 For review of Hong Kong Tim Ho Wan @ IFC Mall, click here. Small table size and limited personal space is something to remind you of Hong Kong, but be glad you are given a slightly bigger personal space here. This place can sit maximum about 100 customers. First out from the kitchen within 10 minutes of placing our order are Vermicelli Roll with Pig's Liver ($5.50) and Vermicelli Roll with Sweet and Sesame Sauce ($4.20). The Vermicelli Roll on the Pig's liver filling is slightly thinner than I remember. It is smooth in texture and the pig's liver is cleaned properly, no foul smell, silky, juicy and tender. For sweet and sesame sauce, it has the right thickness, smooth and goes well the with sauce, tasted like one of Littledevil's favourite street food in Hong Kong. For traditional Dim Sum, Prawn Dumplings / Har Gao ($5.50) and Pork Dumpling with Shrimp / Siew Mai ($5). Har Gao here is fresh and juicy with a sticky, soft and resilient skin. What we find interesting about the siew mai is it tasted better after you let it rest a while. Slightly chewy and flavourful with a wolfberry uniquely placed on top to add sweetness to the siew mai. Beef Ball with beancurd skin ($4.20). This dish left a lasting impression during our visit in Hong Kong. They add a little tangerine skin into the ball to create a distinguish taste. When the first order came, the beef ball is over steamed until the beancurd become dry and the supposed unusual flavour of the tangerine aroma did not come out as expected. We ask the a couple of service staffs, if it suppose to be like this. Finally the Executive Chef came out to check with us, graciously accept our feedback and insisted to make us a new batch. This is what I call service. Kudos to them. The result of the second batch is nice tender juicy beef balls with its distinct tangerine skin twist. Finally come the time for reckoning the Baked Bun with BBQ Pork ($4.50). It's thin crispy crust with the texture of a 'Bo Luo Bao', is simply amazing and melts in your mouth. The filling has a familiar sweet juicy char siew flavour chopped pork. Yummyyy, I can say this is as good as the one in HK. If you have to wait in line, this is something that you can look forward too. Steam Chicken Feet with Abalone Sauce ($5). It has a nice rich flavour from the abalone sauce, unfortunately the chicken feet is slightly mushy instead of springy and crunchy comparing to the ones that we tasted in Hong Kong. Hopefully they can do something to get back its crunchiness. The presentation with parsley and cut chilli, show that they are trying to twist Singaporenise in their dish. For desserts, we have Mango Pomelo Sago ($5) and Tonic Medlar & Osmanthus Cake ($3.50). The mango sago is thick, flavourful with a nice combination of sweet and sour. The pomelo taste is somewhat missing. Osmanthus cake is like a jelly, with visible Osmanthus flowers and wolfberries in the jelly. It is very flavourful and it is not as sweet as we thought it is going to be. Service is very good. Their service staff is very friendly including the trainee. 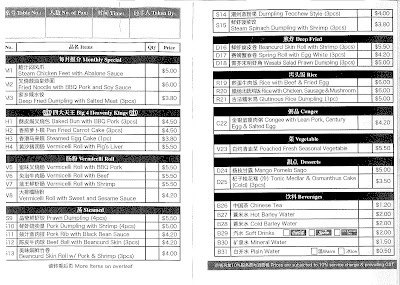 According to the service staff, they are going to open take away counter on the 1st floor in the near future. At the moment, they only entertain dine in. If you want to take away after you dine in, you can order but you need to pack yourself due to the company policy. Styrofoam box and plastic bag will be provided FOC. Overall, we like what we saw. Although all the food is not one hundred percent of the Hong Kong standard, it is close enough, especially on the Baked Bun with BBQ Pork. I hope the line will not be as long as the one in Plaza Singapura in the future. All I can say is that from the soft launch, it can only gets better. Cheers!! No Reservations, Everybody must queue.